I he name of this species refers to its long, slender tail, soft, hairy-looking plumage, and plump body, together with its habit of clambering and scurrying over and around plants. The feet are unusual because all four toes often point forward, allowing the bird to hang from a perch with all the claws hooked over it. The outer toe can be reversed into a more normal posture enabling the bird to hop, walk, and run quite well. This species occurs in regions of dry thorn scrub, w here it travels in level flight over short distances with whirring wingbeats and occasional glides. The main food is green leaves. The mousebird eats a large amount, digesting them slowly, and it often has a potbellied appearance. Its habit of hanging from a perch with feet spread wide at shoulder level could be related to the need to accommodate the bulging crop and full stomach, f ruit, seeds, and some nectar are also eaten. Blue-naped Mousebirds are sociable and usually occur in parties that rest clustered together, roosting in tight huddles and preening each other. Most activities are communal, and the nests arc grouped fairly close together. 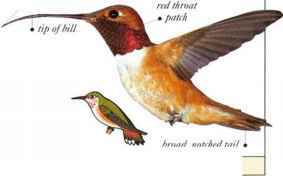 Birds call frequently, uttering a soft, piping, two-note whistle, both in flight and when perched. • NliST An untidy, shallow cup nest made of plant material, often lined with fresh, green leaves, and situated in a bush or a tree. • DISTRIBUTION Tropical Africa, from Senegal to Somalia and south to Tanzania.